Marchers call for an end to gun violence. 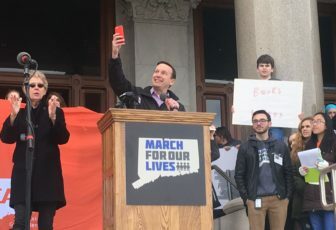 Thousands of students, parents, residents and activists poured onto the north steps outside the Connecticut Capitol Saturday to join marchers across the nation in calling for an end to gun violence. 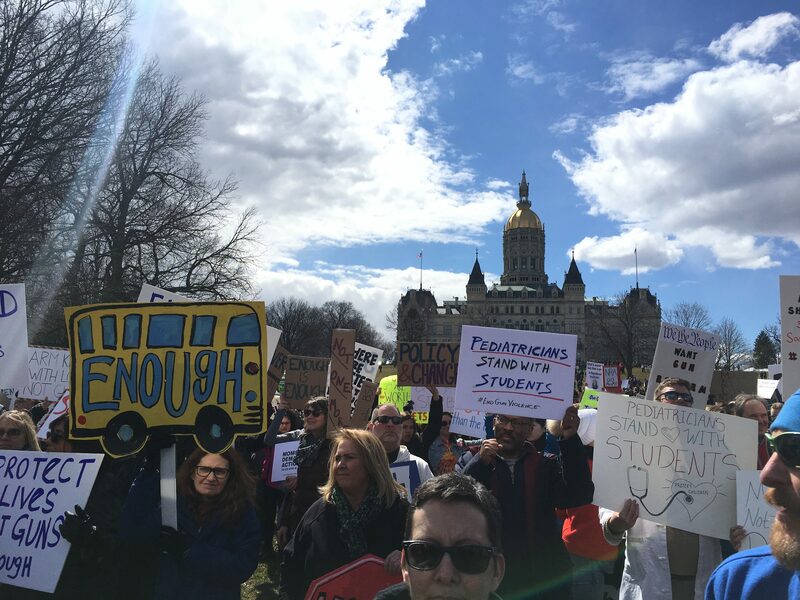 The Hartford marchers were among hundreds of thousands of protesters who took part in more than 800 “March for Our Lives” rallies demanding more gun control and empowering youth to register to vote. Student survivors of the mass shooting in Parkland, Fla., that left 17 dead at Marjory Stoneman Douglas High School organized the main event in Washington, D.C., where marchers stood packed along Pennsylvania Avenue. Organizer Tyler Suarez speaks at the Hartford rally. University of Bridgeport freshman Tyler Suarez said he created the march in Hartford knowing there would be people that wouldn’t be able to go to the event in Washington. Suarez was in eighth grade when a gunman killed his aunt Dawn Hochsprung, then principal of Sandy Hook Elementary School, 20 first-graders and five other adults in Newtown. Emily Kendricks, 15, said she used to live in Coral Springs, Fla., and would have gone to Stoneman Douglas. The Bloomfield teenager said she hopes the nationwide marches bring a ban on assault rifles. “I think with the amount of school shootings, more kids should be coming out because it’s affecting us a lot,” Emily said. Students, activists and elected officials took turns addressing the crowd — stressing the importance of going to the ballot box and keeping up the momentum started by the Parkland students. U.S. Sen. Richard Blumenthal told the marchers he has never felt closer to common-sense gun reform and praised the Stoneman Douglas students for leading the grassroots movement. “Kids are forced now to go through lockdown drills that simulate mass murder in schools. What have we done wrong that this is what we’re teaching in schools — about how to hide in a closet so that you don’t die,” Stein said. U.S. Sen. Chris Murphy takes a video of the crowd. 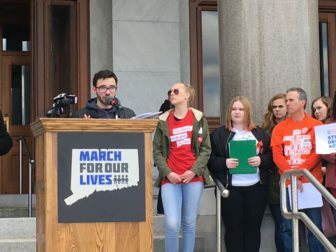 Andrew Riberio, a 17-year-old Trumbull High School student, said he doesn’t feel safe at school and “it’s getting worse as time goes on.” The school should implement metal detectors, more security before walking in and identification cards, Andrew said. “The fact that 14-year-olds are dying and they have no chance; they don’t deserve to die; there’s nothing that they did wrong, and it hits me,” Andrew said. Other marchers said the announcement by President Donald Trump Friday that the Department of Justice was issuing a proposed regulation banning bump stocks — devices that allow semiautomatic rifles to fire like matching guns — was merely a step. Ellie Nicol, 59, of Woodbury, said she wants to see common-sense gun regulation involving age and mental health restrictions but does not want to arm teachers. Nicol said she is an art therapist who worked with a lot of the Sandy Hook families after the massacre. The crowd at the Hartford March for Our Lives.